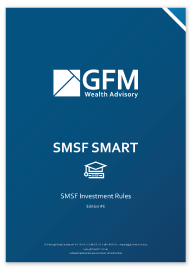 In this edition of SMSF Smart, we look at SMSF Investment Rules. As always, we encourage you to ask us any questions if you need further information or clarification. The provision of benefits for the member’s dependents or the member’s legal personal representative in the event of the member’s death. Trustees must ensure that the SMSF does not undertake an investment that provides pre-retirement benefits to members or related parties. An SMSF is not permitted to provide a direct or indirect financial benefit to a member or relative when making investment decisions and arrangements. Collectables and personal use assets include artwork, jewellery and antiques, for example. SMSFs can invest in collectables and personal-use assets; however, strict rules apply to SMSFs investing in and maintaining those assets. Investments in such items must be made for legitimate retirement purposes, not to provide any present-day benefit. If the item is transferred to a related party, this must be at market price as determined by a qualified, independent valuer. For collectables and personal use assets held before 1 July 2011, an SMSF had until 30 June 2016 to comply with these rules. Also, investments into this asset type must also be in line with the Fund’s investment strategy. An SMSF investment strategy generally outlines the investment plan the Trustees will aim to follow to achieve the SMSFs stated investment objective(s). The investment strategy requirements aim to ensure that all investment decisions are carefully considered and are not made without reference to the SMSF’s circumstances. The strategy should detail what asset classes the SMSF will invest in and the relative percentage weightings and benchmarks of each asset class. Who is a related party of an SMSF? Generally, an SMSF is not able to acquire, purchase or transfer to the SMSF, assets from related parties. Listed securities acquired at market value, for example, shares listed on the ASX. Where a Trustee deals with a related party, the dealing must be on an arm’s length basis. The purchase and sale price of SMSF assets should always reflect the true market value for the asset. The arm’s length investment rule states that an SMSF Trustee must deal with the other party to an investment transaction at arm’s length. An arm’s length transaction is one where an agreement is made by the parties freely and independently of each other and on commercial terms. Where a Trustee is not dealing at arm’s length, the terms of the transaction are no more favourable to the other party than they would have been if they were dealing at arm’s length. While a transaction may comply with the arm’s length rule, it may be in contravention of another provision of the super laws or income tax laws. SMSFs are prohibited from making an investment (in the form of an investment, loan or lease of assets) that represent in total, more than 5% of the market value of the total SMSF assets with any related parties. These related party investments are called ‘in-house assets’. Typically, a lease arrangement of a Business Real Property with a related party would also be an in-house asset, if it was not for a specific section in the superannuation laws that exclude Business Real Properties subject to a valid lease or lease arrangement that is enforceable by legal proceedings with a related party from being an in-house asset. The in-house asset rules apply to restrict the number of the SMSF’s investments with related parties and ensure that the investments are made on commercial terms. The in-house asset rules act as protection for members so that members will not lose all of their benefits in the SMSF if an in-house asset goes bad. An SMSF is not permitted to lend money to a member, or the relative of a member, in any circumstances. While an SMSF can lend to others, Trustees should consider the SMSF’s investment strategy and Trust Deed to determine whether the investment is legal. A Trustee can use a limited recourse borrowing arrangement to fund the purchase of a single asset (or collection of identical assets that have the same market value) to be held in a separate trust. A Limited Recourse Borrowing Arrangement (“LRBA”) is a special borrowing arrangement that is permitted. A specific characteristic of an LRBA is that in case of default, the lender’s rights are limited to the asset which is the subject of the LRBA. The lender will have no recourse to other assets owned by the Trustees of the SMSF. The loan agreement must specify that it is an LRBA. Trustees need to ensure that the LRBA is correctly structured. The borrowing arrangement must also comply with all other ordinary provisions of super law. Generally, the Trustee uses the borrowed funds to purchase a single asset, such as property on a single title to be held in trust on behalf of the SMSF. The SMSF accounts for all income and expenses relating to the asset held in trust. SMSFs are required to be established and operate solely for superannuation purposes. This means that benefits must be maintained for the sole purpose of providing retirement benefits to members, or to their dependants if a member dies before retirement. SMSFs must comply with the sole purpose test to be eligible for the tax concessions available to a complying super fund. Involvement in a contravention may result in the disqualification of the Trustee, attract a civil or criminal penalty and may place the SMSF’s status as a complying fund at risk. Getting the right advice and expert guidance is crucial with SMSFs. The decision and rules for paying a benefit can be quite complex. While there is greater control with an SMSF, there is also more responsibility. The ATO encourages individuals to engage professionals to help establish and run their SMSF, and this is where GFM Wealth Advisory can help. Disclaimer: This document is not an offer or invitation to any person to buy or sell any interest in or deposit funds with any institution. The information here is of a generic nature, and does not take into account your investment objectives or financial needs. No person should act upon this information without firstly seeking competent, professional advice specifically relating to their own particular situation. Copyright: © This publication is copyright. Subject to the conditions prescribed under the Copyright Act, no part of it may, in any form, or by any means (electronic, mechanical, microcopying, photocopying, recording or otherwise) be reproduced or transmitted without permission. Enquiries should be addressed to GFM Wealth Advisory.